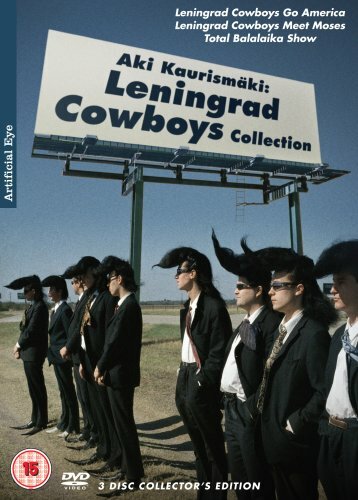 Finnish director Aki Kaurismaki's 'Leningrad Cowboys' trilogy. In 'Leningrad Cowboys Go America' (1989), struggling rock 'n' roll band The Leningrad Cowboys quit Siberia, their frozen bass player in the luggage, for a tour of America. Their slave-driving manager secures a car (from director Aki Kaurismaki's American counterpart, cult filmmaker Jim Jarmusch) and several very bad gigs. The undauntable band are then pursued across the States by their only fan and a fish. In 'Leningrad Cowboys Meet Moses' (1994), the Cowboys decide to return to their native village after years of fame and misfortune in Mexico. Under the guidance of their former manager Vladimir (Matti Pellonpaa), who now calls himself Moses, they face a difficult journey over the ocean and across the European continent. But tormented by lack of money, fuel and beverages the band begin to murmur against Moses and doubt his motives. On top of this they are persecuted by a certain member of the American intelligence agency who is hunting for the lost nose of the Statue of Liberty. In 'Total Balalaika Show' (1994), the Cowboys perform for the first time with the 100 singers, 40 musicians and 20 dancers of the Alexandrov Red Army Chorus and Dance Ensemble, on the biggest stage ever seen in Finland. A roaring success, the programme included rock classics from 'Happy Together' and 'Delilah' to 'Gimme All Your Lovin' and 'Knocking on Heaven's Door', as well as traditional hits from the Ensemble's own repertoire. The film portrays an unforgettable encounter of the old and the new, East and West. Finnish director Aki Kaurismaki's 'Leningrad Cowboys' trilogy. In 'Leningrad Cowboys Go America' (1989), struggling rock 'n' roll band The Leningrad Cowboys quit Siberia, their frozen bass player in the luggage, for a tour of America. Their slave-driving manager secures a car (from director Aki Kaurismaki's American counterpart, cult filmmaker Jim Jarmusch) and several very bad gigs. The undauntable band are then pursued across the States by their only fan and a fish. In 'Leningrad Cowboys Meet Moses' (1994), the Cowboys decide to return to their native village after years of fame and misfortune in Mexico. Under the guidance of their former manager Vladimir (Matti Pellonpaa), who now calls himself Moses, they face a difficult journey over the ocean and across the European continent. But tormented by lack of money, fuel and beverages the band begin to murmur against Moses and doubt his motives. On top of this they are persecuted by a certain member of the American intelligence agency who is hunting for the lost nose of the Statue of Liberty. In 'Total Balalaika Show' (1994), the Cowboys perform for the first time with the 100 singers, 40 musicians and 20 dancers of the Alexandrov Red Army Chorus and Dance Ensemble, on the biggest stage ever seen in Finland. A roaring success, the programme included rock classics from 'Happy Together' and 'Delilah' to 'Gimme All Your Lovin' and 'Knocking on Heaven's Door', as well as traditional hits from the Ensemble's own repertoire. The film portrays an unforgettable encounter of the old and the new, East and West.